Get to know Franklin-McKinley Schools! Join us at an Open House! As you know, preparing for a successful future, begins before your child enters Kindergarten and we want to invite all prospective families to join us at one of our open house events! Additionally, we want to ensure that students have the best transition possible to Middle School by visiting the campus, meeting the staff, and learning about all the wonderful programs our schools have to offer. Learn more about our upcoming Open Houses hosted by our schools to welcome you and your children to Franklin-McKinley and support 6th grade students transitioning to Middle School. We are excited at the possibility of having your child begin their educational journey here at Franklin-McKinley School District and to open the doors to our Middle Schools for those students transitioning to 7th grade. It is never too early to begin thinking about your child's future. Franklin-McKinley offers excellent educational opportunities for children. The following is a list of dates and times where our community is welcome to attend and learn about the Transitional Kinder, Kinder, and Middle School experience in Franklin-McKinley Schools. Transitional Kindergarten (TK) is the first of a two-year Kindergarten experience for children turning 5 years old between September 2, 2019 and December 2, 2019. TK gives our youngest Kindergarten students a head start in instruction and provides them with an opportunity to learn and grow in an environment tailored to meet their academic and social needs. How do I enroll my child into Transitional Kindergarten? In order to enroll your child into Transitional Kindergarten, you will need to identify which school your address belongs to using the school locator and then visit the School Secretary/Child, Welfare and Attendance Office in person to begin the process. Enrollment for the 2019-2020 school year begins February 1, 2019. What is the cut off date for Kindergarten? California law indicates that children must turn 5 years old on or before September 1st in order to enroll in Kindergarten. 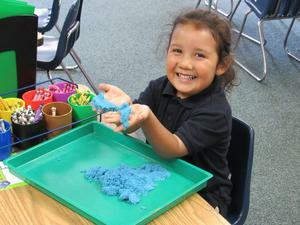 Students in Transitional Kindergarten receive an additional year to develop their early academics and social skills. TK builds the foundation to be successful in Kindergarten. Transitional Kindergarten benefits include ensuring our youngest learners build skills and experiences they need to be successful in kindergarten while giving them an opportunity to learn academically through meaningful play. It also gives students higher self-confidence, better relationships with other children and adults, and are more likely to attend college. What is the cost for Transitional Kindergarten? TK is FREE for all eligible California children. For more information or questions, please contact the Student Wellness & Support Services Office at (408) 283-6092.